Human resources are the bread and butter of any company. That’s why it’s important to streamline HR processes and make the lives of HR managers and employees easier. In this article, we present our vision of how to make a successful mobile app for HR. HR mobile apps address many of the communication challenges within organizations, including employee engagement, two-way communications, and even sharing news and alerts. HR mobile apps give managers on-the-go access to HR and financial information, allowing them to make real-time decisions and increase productivity. Employees can do everything they can on a company-issued computer, only remotely: manage profiles, contact details, responsibilities, and other data. An HR mobile app can eliminate the need to use a desktop or laptop or to make a phone call to ask questions to HR representatives. 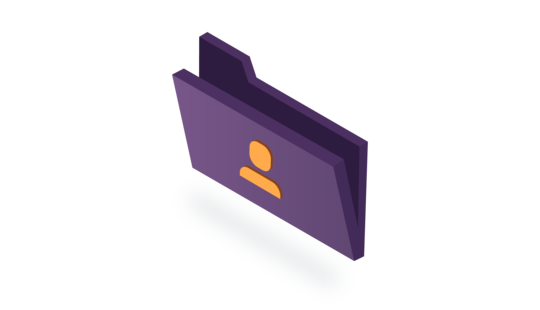 In addition, the ability for employees to manage their personal profiles whenever they want and wherever they are provides even more flexibility and convenience. One of the best examples of an HR mobile app is Cezanne. It provides easy and fast access to an employee’s holiday balance, absences, and pending tasks as well as contact information of colleagues and more. Mobile technology lets employees spend less time managing HR issues and increase their productivity on more important tasks. 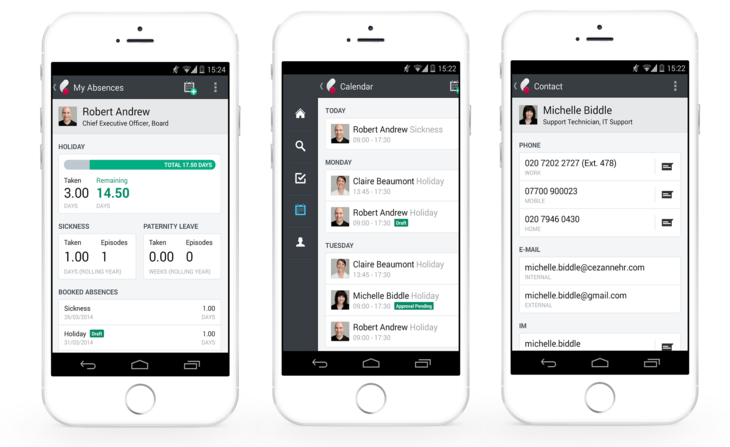 Sezanne HR mobile app provides easy and fast access to an employee’s holiday balance, absences, and pending tasks as well as contact information of colleagues and more. Mobile HR apps can help companies track employees’ achievements and get instant feedback, not only feedback once a year around the winter holidays. Lots of companies big and small are trying to reinvent their performance management by introducing HR mobile apps to give and get continuous feedback. With the help of such technology, organizations can survey their employees to provide better engagement and increase satisfaction. For example, the People HR mobile app has a pulse survey function to get rapid employee feedback on any topic. To err is human. It’s okay when people make mistakes, and HR managers can also miss things, especially when the company counts hundreds of employees. Making HR processes mobile reduces the chance of human error. It helps the HR department to automate time entry, approving vacation requests, and absenteeism. To add even more convenience, all this information is always with HR managers even if they’re far away from their workplace. 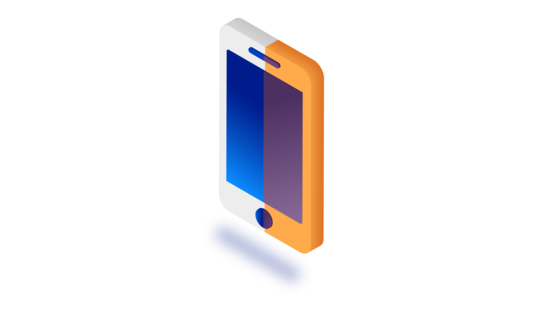 With an HR mobile app, companies are able to create an employee directory with search functionality, phone numbers, emails, postal addresses, and other information on colleagues. This can help improve communication within the company. 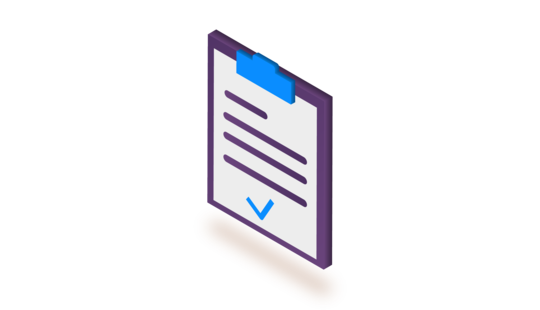 A user can simply access the employee directory and look up a contact without being chained to the desk. An employee directory allows coworkers to connect seamlessly via their phones. Mobile devices have overtaken desktops as the main way to access the internet according to research by Smart Insights. The workforce has growing numbers of employees who prefer using mobile phones in their workflow. In addition, if a company provides an HR mobile app, workers feel more interested and engaged as it helps greatly in managing routine tasks. By notifying employees about important things through a mobile app, an organization increases the chances that workers will receive these notifications even if they’re out. Push notifications are a convenient, productive, and efficient decision for any company. First of all, let’s start with defining what app monetization is. App monetization is a way to make money from a mobile app. Below, we will present several monetization strategies for mobile apps. Business-to-business, or B2B, is a traditional software sales model. It’s based on selling a mobile app directly to a company and is suitable when making mobile apps for a specific customer. 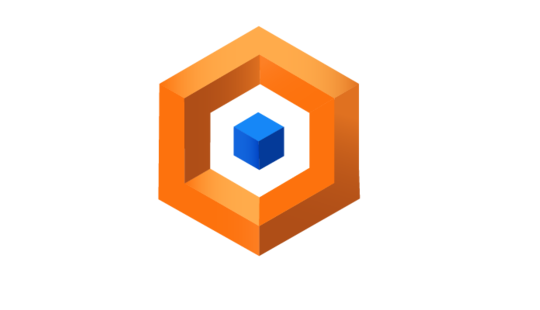 The pay-per-download model is extremely simple and the most frequently used model. With pay-per-download, the user is generally charged before the app is installed, but the app stores take their share of the profit. Freemium apps cost nothing to download but provide only basic functionality. 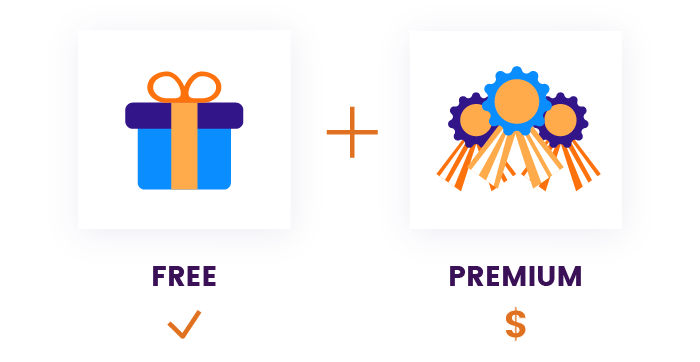 To get premium or proprietary features, users have to pay. After using the free version of an app, users might realize that the additional features that cost money will help them a lot. For example, the Zoho People HR mobile app is free only for five employee logins and 10 profiles, and storage is limited to 250 MB. You have to pay to get more unique features, more profiles, and more storage. Native. 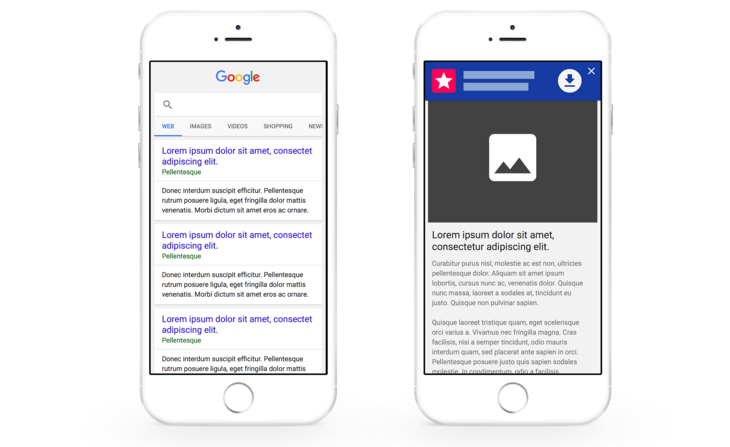 These ads provide an integrated experience with layouts that match your app design. The biggest advantage of native ads is a much higher response rate. Probably this is because native ads blend in with the app content, making the ad look editorial rather than pushy. This prompts users to click it. Banner. These ads appear as a small strip across the top or bottom of the screen. Banner ads are the most commonly used ad format for mobile. They are less intrusive, can be ignored, and don’t interrupt the user. Interstitial. These ads cover the full screen of the application interface. 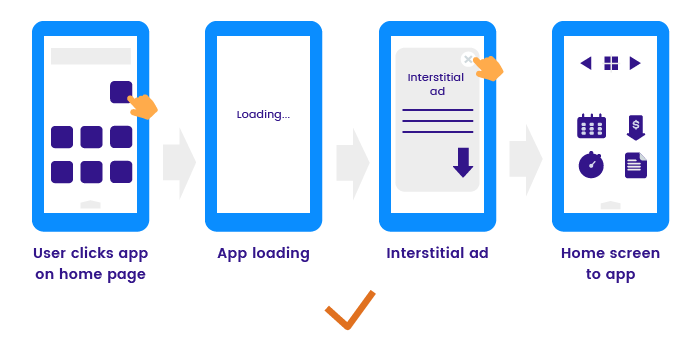 Unlike banner ads, interstitial ads force users to interact by clicking out or clicking through them. These ads will definitely grab the viewer’s attention, but many users find them irritating. Imagine that a business has found the perfect app that meets all their needs. It covers all HR department tasks except recruiting and hiring. While using this app, the business owner sees an ad promoting your app with recruiting or hiring functionality. Will they be interested? Probably they will. If your partner who offers complementary software includes advertisements featuring your apps, there’s a solid chance their users will click those ads to go straight to your app. That’s how partnership ads work. As today’s app market is increasingly competitive, organizations find it increasingly difficult to create a really successful mobile app. 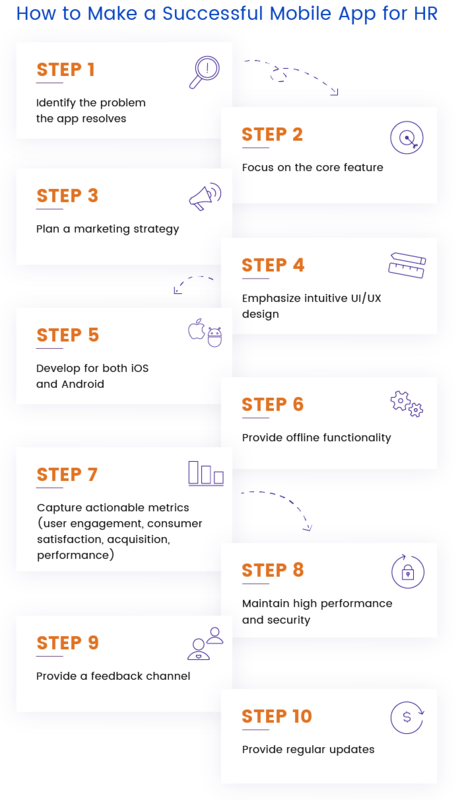 In order not to get lost in the sea of existing advice and guides, we suggest looking at the most important steps to run a successful HR mobile app. A really successful product should solve a pressing problem of a business or customer. Ask yourself what problem the app will solve for users and how it will simplify their lives. 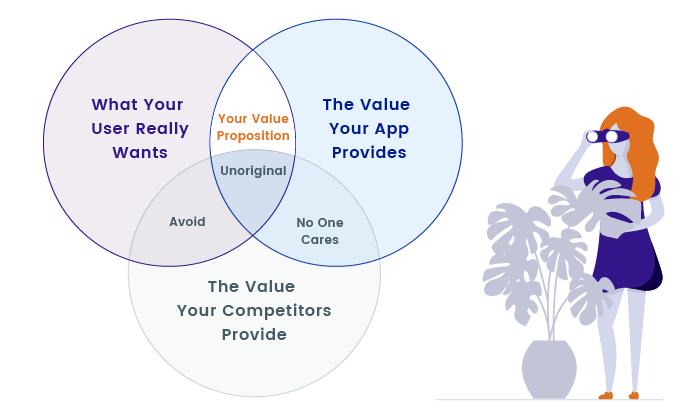 The perfect app should have a sense of purpose and meet most of the customer’s needs. It should provide a customer with tangible benefits such as reducing costs and increasing security and revenue. For example, your target audience might want a secure and convenient app to enhance overall productivity, get instant feedback, and improve employee engagement. Creating an HR mobile app with that in mind will bring better results for your brand as the app will solve a particular problem of a particular user group. Any app should be created with target users in mind. Don’t waste money on developing functionality that won’t be suitable for your customers. Instead, listen to what the customers want and appreciate while using the app. If you want users to download the app, make sure it’s offering what they really want. The key to identifying the app’s target audience is to conduct research at all stages of development. One of the best ways of determining who needs your app is to create personas or portraits of future users. Archetypal users, or personas, represent the needs of larger groups. Typically, the description of a persona includes age, gender, occupation, hobbies, preferences, and more. After creating personas, use them to explore your app idea and how it suits your personas. Gaining an understanding of your target market will have a major impact on the app’s development and even pricing structure, so knowing your audience is vital. Mobile app performance can greatly affect the app’s reputation, rating, and revenue. 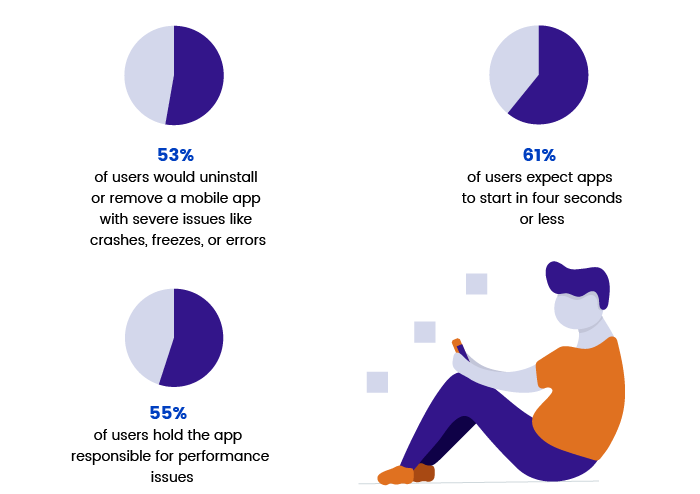 According to a survey by Dimensional Research, 80 percent of app users will only attempt to use a problematic app three times or less, while 36 percent say they will have a lower opinion of an app with performance issues. If the budget allows, choose a native app over a web or hybrid app. Why? Native apps offer the fastest and the most responsive experience to users. Such apps can easily tap into wider functionality, namely cameras, compasses, microphones, and swipe gestures. They can also make use of push notifications, which bring the audience back for more. Big and heavy images slow a mobile app down. By compressing an image, you minimize its size without compromising its quality. In addition, you can resize images so the app doesn't use an unnecessary amount of bandwidth. Less is more. Some developers try to implement as many features as possible in the app, assuming that this is what users really need. But it’s much better to cut down on features if they affect the app’s stability and reduce the user experience. Consider which core features are vital for the app and target audience and focus on them. Elaborate usability tests are a waste of resources. The best results come from testing no more than five users and running as many small tests as you can afford. Mobile phones are small and have few buttons, so it takes more effort to make mobile apps usable and comfortable. Is the app fast or slow? Is the app navigation clear? Is its UI/UX design compelling? Would I ever install and use this app? Answering these questions while testing can show you the real state of the app. 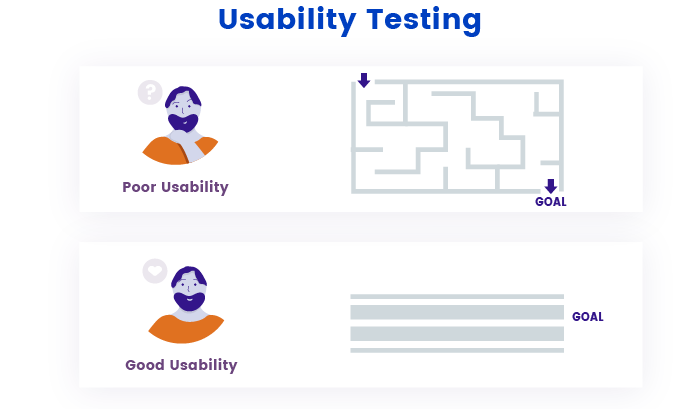 The most optimal variant is to create a usability plan to determine what areas to concentrate on and choose an appropriate audience for conducting usability testing and getting valuable feedback. As you can see, HR mobile apps offer a real advantage over doing HR work manually and even over using a web application. If you want to discuss how RubyGarage can help you create a unique HR mobile app, just drop us a line.